Dictation on the Mac is fantastic, and if you have chosen to use Enhanced Dictation then you’ve downloaded a 1.2GB voice recognition pack to your Mac locally so that it can improve the overall functionality of the feature. That’s fine and dandy, but at some point if you decide you no longer need the Enhanced Dictation feature, you might want to reclaim that 1.2GB of disk space. 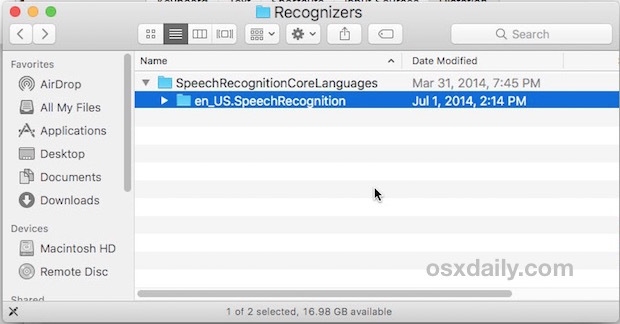 We’ll show you how to remove the Enhanced Dictation voice recognition pack and reclaim the 1.2GB of disk space from a Mac. This is a two part sequence, first you need to disable Enhanced Dictation, and then remove the recognition pack. Obviously if you do this, you will lose the ability to have enhanced dictation unless you re-download the pack from Apple again. Thus, you’d only want to perform this task if you enabled the feature and don’t need it, or if you no longer use the enhanced ability. To be clear, you can disable enhanced dictation and still use the Dictation feature, but it won’t work offline and it won’t necessarily be as accurate. If you want the full experience and full clarity for the various dictation commands, you should use the enhanced dictation feature. This works on any Mac that supports enhanced dictation, regardless of the system software version in use or whether or not it’s labeled as Mac OS X or macOS. Dictation has it’s own preferences and there’s no separate “Dictation” tab under Keyboard. At least not on Yosemite, so I guess its location varies by OS. Does tis affect Siri’s ability to understand what you say? Thanks for this, actually did this in reverse as I kept getting an error trying to download the Dictation Pack. Was able to transfer the folder from another Mac and everything is working now.